Several thousands of protesters are currently marching on the streets stretching from the Place Charles de Gaulle. They seem to be in a more aggressive mood than during several previous demonstrations. As a group of protesters tried to storm a police barrier near Place des Ternes, police officers used tear gas to disperse the crowd. 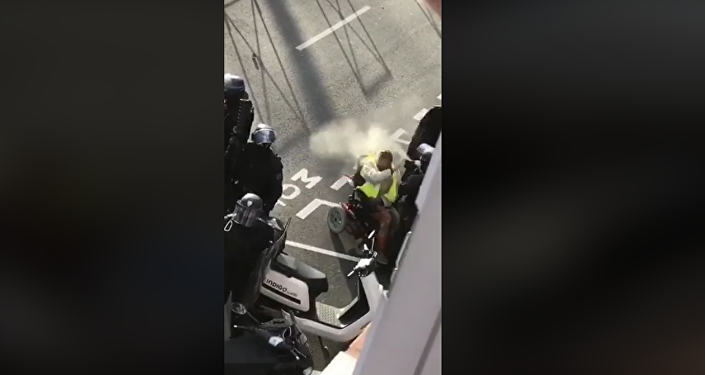 As yellow vest movement supporters, who started to gather at the Place Charles de Gaulle before dawn, continue their march across Paris, some of them are setting plastic trash cans on fire, destroying municipal electric scooters and exploding fireworks. Protesters are singing songs about a crowd heading to French President Emmanuel Macron's residency in the Elysee Palace — and this is exactly where the organizers of the rally want them to come from different parts of the city. Police have taken measures to ensure security, with gendarmes limiting the movement on Champs-Elysees. A water cannon and two armored vehicles have been deployed to downtown Paris. The wave of protests started in France in mid-November last year. While the government abandoned its plans to raise fuel taxes, which triggered the rallies in the first place, and introduced other measures to improve the country's socioeconomic situation, protesters continue to take to the streets across France every weekend. Yellow vest protests have been marked with violent clashes between activists and security forces. Yellow Vest protesters have torched and looted a number of stores on the Champs-Elysees avenue in Paris on Saturday. — Dr. Ghazi Ben Ahmed (@Gbaghazi) 16 марта 2019 г. The number of those detained in Saturday's yellow vest rallies in Paris has risen to 94, the BFMTV broadcaster reported, citing local police. Earlier in the day, media reported about 64 people detained in the rallies. 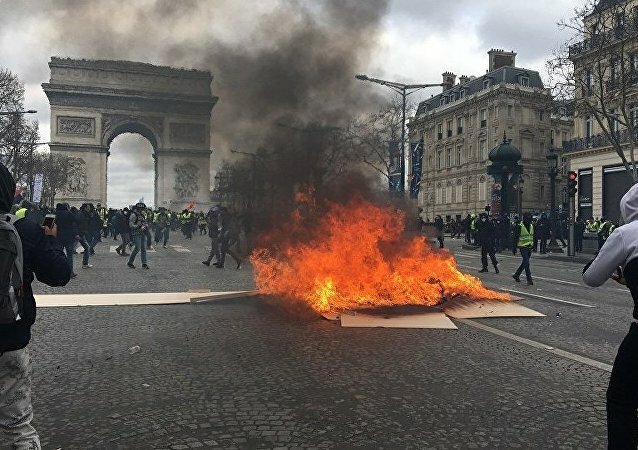 According to the broadcaster, the demonstrators attacked a police car near the Arc de Triomphe and hurled a road sign at another one. According to Interior Minister Christophe Castaner, a total of 14,500 people are participating in the Saturday protests nationwide, including 10,000 rallying in Paris alone. Over 7,000 people are taking part in the yellow vest protests in the French capital of Paris on Saturday, French Interior Minister Christophe Castaner said. "From 7,000 to 8,000 people are currently rallying in Paris, and out of them around 1,500 people are ultraviolent, and they have come to destroy and to attack," Castaner said as aired by the BFMTV broadcaster. 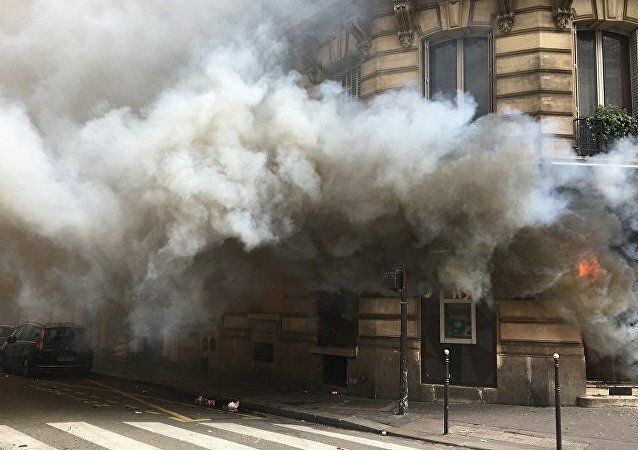 A bank (La Banque Tarneaud) in Paris has been set on fire during Yellow Vests protests. Sputnik and RT Editor-in-Chief Margarita Simonyan said on Saturday that a producer of the Ruptly video agency, which is a project of the RT broadcaster, had his leg injured during the ongoing yellow vest protests in France, adding that he was on his way to hospital. "The producer of our video agency Ruptly had his leg injured at the yellow vest rallies. He is on his way to hospital. I hope he will be fine," Simonyan posted on her Telegram channel. According to RT Telegram channel, the producer could have been injured by a rubber bullet or a stone. He was reportedly livestreaming when he was injured. — Gilets Jaunes Paris #Acte18✊ #Le16TousAParis (@GiletsJaunesGo) 16 марта 2019 г. — Axel Roux ツ (@AxlRx) 16 марта 2019 г. — Liveuamap Français (@liveuamapfr) 16 марта 2019 г.